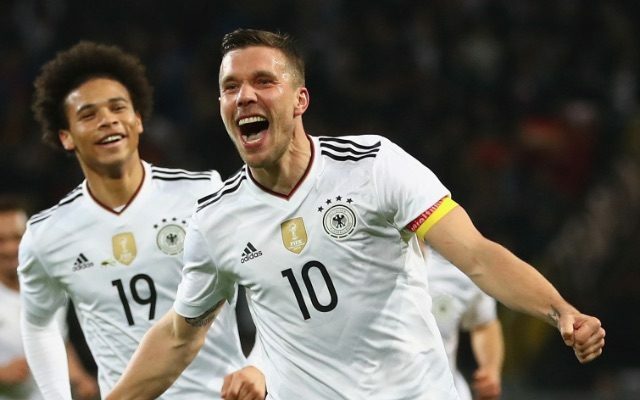 Lukas Podolski ended his international career with a BANG on Wednesday night as he scored this worldie winner to hand Germany a 1-0 win over rivals England. Playing his final match for Germany, Podolski marked his 130th and final appearance with his 49th international goal, which came on 69 minutes of what was a very even game. In fact, England might feel like they shaded the contest in terms of chances. However, the Three Lions only worked goalkeeper Marc-Andre her Stegen with two of their 11 shots. Despite the result, England will be encouraged by how they went toe-to-toe with one of the best teams on the planet. Ultimately, though, it was fitting that Podolski separated the sides on a night that belonged to him.